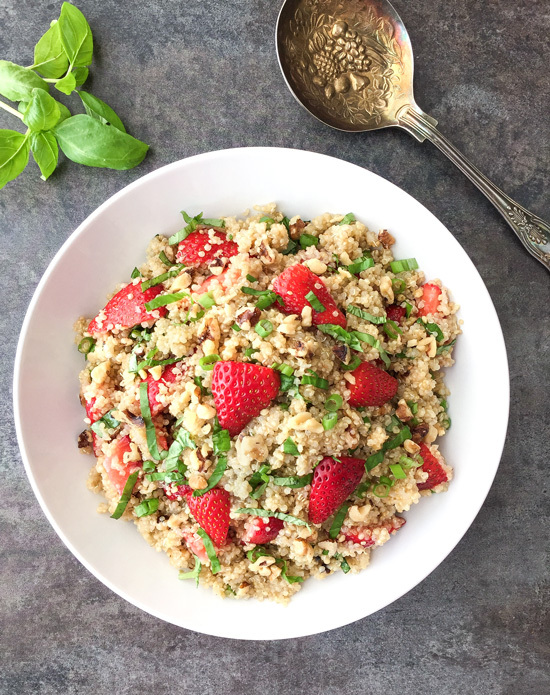 This Quinoa Salad recipe features a basil-balsamic dressing, fresh strawberries and has a nice crunch from the addition of walnuts. It’s a refreshing salad for the hot Summer months! I’ve been a huge fan of strawberries ever since I was little. Strawberry Shortcake was one of my all-time favorite desserts as a kid. My family used to go eat at Wyatt’s cafeteria, and I have fond memories of going through their line and picking out what I wanted. Who else here can remember going through the line and picking out their food at Wyatt’s? Getting to the dessert section of the line was my favorite part. We got to pick out a strawberry shortcake for me and my brother to share. So delicious! Okay, I mainly just loved the strawberries, syrup and whip cream. 😉 I wasn’t a huge fan of the cake part. Fast forward a couple of decades, and my tastes have grown up a bit. I really enjoy the spinach salad at La Madeleine, which has pecans, bacon and strawberries in it. Crunchy pecans, salty bacon and the sweetness from the strawberries is sheer deliciousness. The only part I don’t really like is the mushrooms. I pick those out and let my husband have them. I’m trying, but y’all, I just haven’t found a recipe yet that has made me a fan. I’ll eat them because they’re good for you, but no, I do not enjoy them. 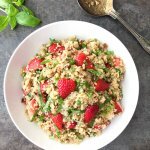 Using strawberries in a non-dessert or smoothie recipe of my own like this Quinoa Salad was a first for me. The fresh flavors of the strawberries and basil just go so well together and they absolutely scream Summer. This Quinoa Salad recipe is a healthy and light side dish that would be great to serve alongside some grilled chicken, salmon or shrimp. I love all of the textures going on in this quinoa salad recipe, especially the crunch that the walnuts add. 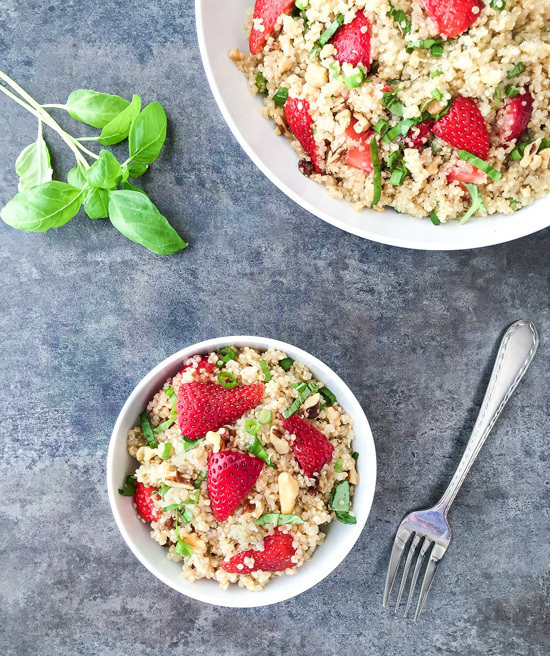 A tasty quinoa salad with fresh strawberries, crunchy walnuts and a basil-balsamic vinaigrette dressing. Perfect for the Summer months! In a medium sauce pan, add the water, quinoa and 1/4 tsp of the salt. Bring to a boil, reduce heat to low, cover, and simmer until quinoa is tender and water has been absorbed, 10 to 15 minutes. On a rimmed sheet pan, spread the quinoa out and set aside until cool and tender, about 15-20 minutes. In the bottom of a large bowl, whisk together the dressing ingredients. When the quinoa has cooled, add it to the bowl along with the basil and scallions. Gently toss to combine, add the strawberries and walnuts and gently toss again, then serve with extra basil if desired. The quinoa package will tell you to use more water, but using less water results in fluffier quinoa, so be use the amount specified in my recipe.